This month’s edition of 4WTW was suggested by a reader – thanks Crystal! (see last month’s post here). Since this is such a versatile piece, it was really hard to choose, but I finally decided on four of my favorites – if you want to see how I layered this piece for winter, check out the posts here and here. Head over to my Facebook page for more photos from this shoot & let me know in the comments below which look is your favorite! Great post! The 2nd and 3rd looks are my favorite, but all 4 of them are great. And I love your accessories in each outfit. I love these! I really need to find a chambray shirt, they're always sold out in my size. Oh yes! My favorite segment of your blog!!! Oh jeez, I love them all! If I had to pick just one it would be the one with the stripe skirt, I have all those pieces and can recreate it! 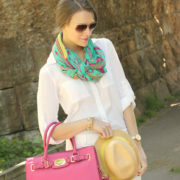 I really adore the leo printed scarf! I too love all the looks, but the second one really jumped out at me! I love the skirt and it looks so put together. And the shoes are spot on! I literally just bought a chambray shirt earlier this week so this post could not have come at a better time! 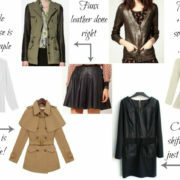 I think the last look is my favorite – I Pinned it to my Outfit Inspiration board! I love all these looks, but my favourite is def. the black shorts – the bowtie and red bag are the perfect accessories! You look so stunning! Today's post on my blog is on the versatility of a chambray shirt too. Lol! oOoOo!!! i LOVE all of these! but i think #1 and #3 are my faves! Awesome! I love it with the striped skirt and with the shorts (2 & 3). You look great! Cute looks!!! My fave is the 3rd one! Love blazer/shorts combo! I love all of these outfits! The outfit with the white blazer is perfect for early spring. LOVE those sandals in the outfit with the striped skirt, but the shorts outfit wins hands down! It's so chic and fun-and those shorts are so gorgeous! How did I miss those?? Thank you very much for your lovely comment and for following my blog!!! I love my chambray shirt. I feel like I wear it all the time. There is just so much you can do with that shirt. Love your ideas! Loving all of these looks! I am sure I am going to copy some of them in the future. I think my favorite is the stripe skirt but I also love the look with the shorts. Gorgeous as always. Just came across your blog and absolutely LOVE it!!! All these looks are phenomenal, but I'm going to have to go with the 3rd – you look so chic! Thanks for posting (I'm headed out to pick up a chambray shirt :)). These are all awesome looks…don't even think I could begin to choose a favorite! 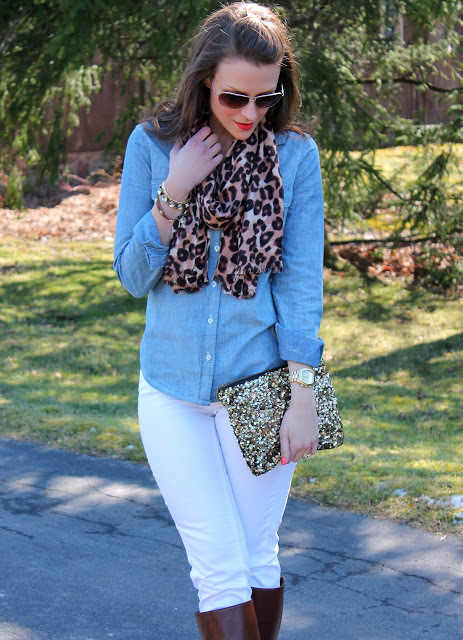 Chambray is awesome! Kim! we love this! 4 looks, 4 flawless looks! you look amazing! The fourth look is my favorite – I just love it! 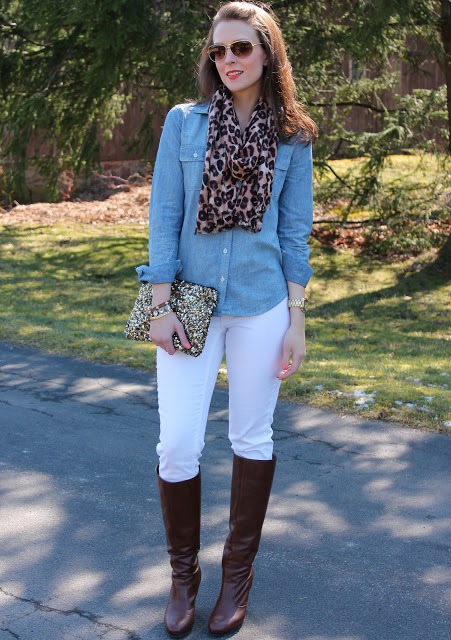 I think I'm going on a hunt for a chambray shirt this weekend! Love all of these looks but especially the 3rd, under the little jacket. So cute! Great looks..love your Zara sequin clutch and forever 21 necklace ! You look so beauitful ! Love all of these! I could wear my chambray shirt EVERY day! How did we ever live without them! LOVE all the looks!! I have my own fashion accessories company and look to help women stay stylish without breaking the bank as well! Can't wait to see what else you have in store! The pairing w/ the high riding boots and the shorts are my two favorites. Can you believe I still don't have one of these babies? Silver Ann Taylor skirt on sale for $13.92!!!! With shipping and tax I only paid $24.00!! What a steal! Thank you 🙂 for the idea of metallics with Chambray…love it!!! !